LEHIGH VALLEY, PA. — Former LA Lakers star and three-time NBA champion, James Worthy, has been named the keynote speaker at the 39th Annual Via All-Star Basketball Classic Banquet to be held at the Sands Bethlehem Event Center in Lehigh, Pennsylvania. The event takes place on Wednesday, March 26, at 6:30 p.m. The banquet will also honor basketball talent from 35 high schools in the greater Lehigh Valley. Photo shows former LA Lakers star, James Worthy, delivering his speech after being enshrined into the Naismith Memorial Basketball Hall of Fame as part of the class of 2003. The Via All-Star Awards Banquet recognizes members of the Via All-Star teams, players and teams of the year, awards scholarships for student athletes & inducts members into the Lehigh Valley High School Basketball HOF. 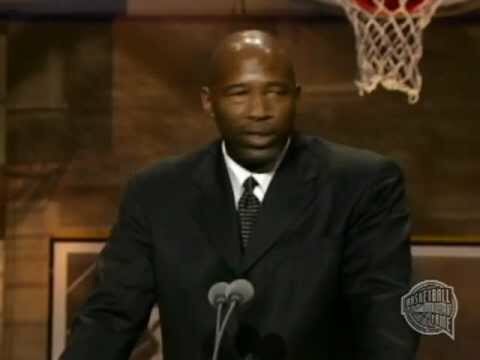 Watch the following video of James Worthy as he delivers his speech upon being enshrined to the Naismith Memorial Basketball Hall of Fame as part of the class of 2003. Named one of the 50 Greatest Players in NBA History, Worthy, played 12 seasons with the Los Angeles Lakers. He was a seven-time NBA All-Star, a three-time NBA champion and the 1988 NBA Finals MVP. He was inducted into the Naismith Memorial Basketball Hall of Fame in 2003. If you would like to book athletes like James Worthy for an event, contact James Worthy’s booking agent for appearance & speaker fees or call 1.855.303.5450.